Make a game of spotting them the next time you go on a food trip! No matter how mouthwatering the food in front of them is, these guys still take the time to get an awesome flatlay shot of their dish. And who can blame them when the food is always IG-worthy? While everyone else gets busy looking for what to eat the minute they step into the food park, this guy's first mission is to find a table and stake his group’s claim to it by sitting down and spreading out various items, from cellphones to bags to the stray shoe. He also serves as tagabantay. He's the person most likely to give you a detailed rundown of every single ingredient used in the dish, and an even more detailed account of every bite he takes. He’s definitely your go-to guy for food recos. "Yes. No, wait. Um. What are you having?" While the diversity of dishes offered at food parks is usually what most people are after, this person has the hardest time deciding whether to go for combo A, B or C.
The antithesis to The Undecided, this person tries everything he sets his eyes on. He's the best person to be with during food trips because he's always game to share all the goodies his palate commands him to try. It’s amazing how these people can zero in on the healthiest thing on the menu every single time. Usually without even needing to ask the vendor or anything! And great news for them: food parks have so much variety, they’re just as spoiled for choice as the rest of us. And then there's the people who are just there to have a good time and try something new. Their drink of choice? 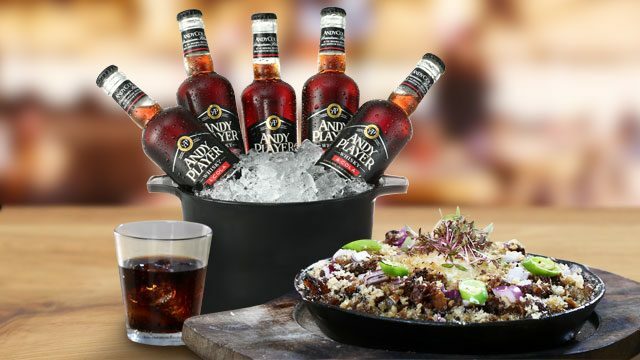 Andy Player Whisky & Cola—the drink that combines the refreshing taste of Cola and the swabe kick of Andy Player Whisky. It suits just about any kind of grub you’ll find inside food parks and it’s exactly what you need for the perfect chillnuman. Of course, Andy Cola isn’t just for those who like to keep it low-key; this drink goes down well no matter how you go about enjoying food parks. At the end of the night, all that matters is that you got your fill of good food, smooth drinks, and great company.